Hey everyone. 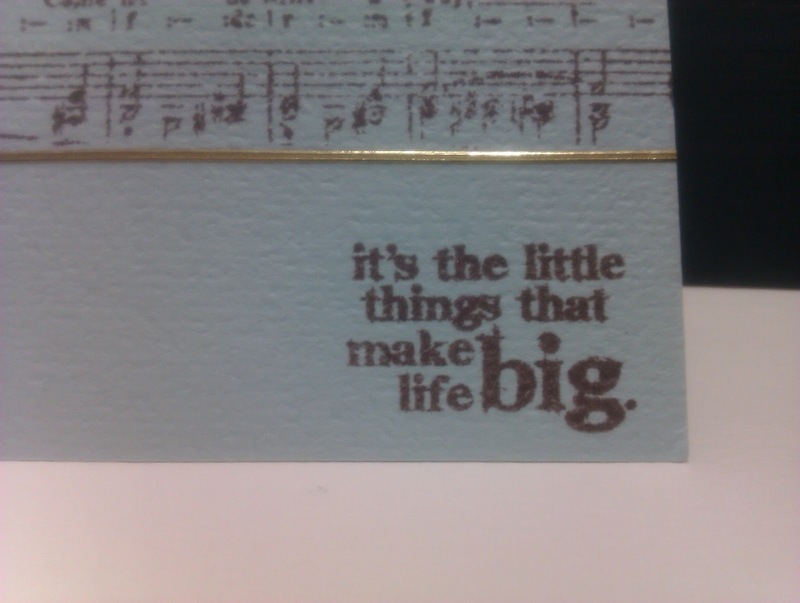 I know, I always say that I don't make cards........and looking at this card, its pretty obvious that I don't, lol. But I needed a couple of thank you cards and thought I'd have a bash at making them myself. They are very simple because I'm completely rubbish at making cards but I like plain and simple cards. So this is what I came up with. I'm meeting up with my wee matey, Maddy Madster today (Ooooo get me with my alliteration ) ......YIPPEEEE! You all know Maddy, from her Blog Izzwizz Creations and if you don't....click HERE. So we are meeting up to have a good aul natter and try to set the world to rights, lol. All we need is some double sided tape and a good pair of scissors and that'll sort out the world's problems, heehee. Anywhoodles, here is my attempt at card making......very simple card making, lol. 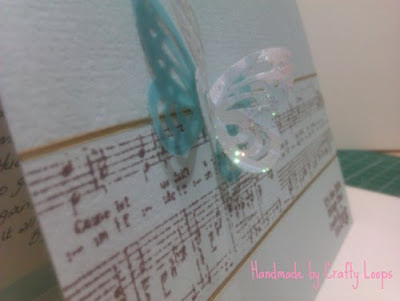 I used the butterfly Tonic punch and punched out one butterfly from a blue vellum and the top butterfly is actually a piece from a wallpaper sample. I love going to B&Q and getting a few wallpaper samples. Its great stuff to craft with and the paper quality is fabulous and thick. Obviously due to Copyright Laws I wouldn't advise anyone using wallpaper samples in anything you sell. But certainly using it for personal use shouldn't be a problem. I then took a paint brush and brushed on stickles to add a bit of sparkle to the butterfly. This is a Timmy Holtz stamp. I love this sentiment. 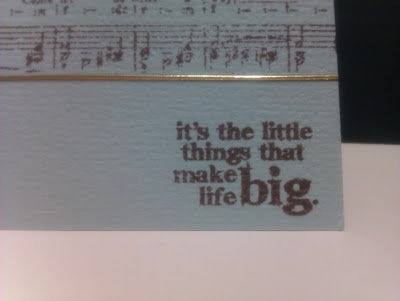 I also used 2 gold line peel off's to border the stamped image and help make it pop a bit more. 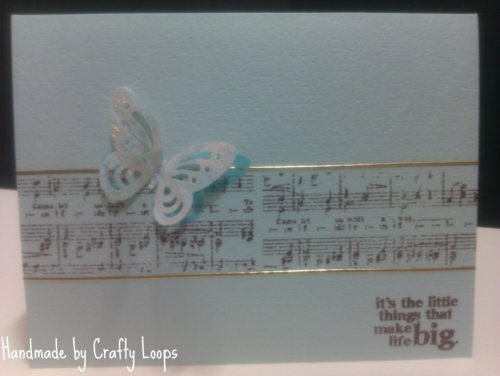 Isn't that music note stamp just beautiful? 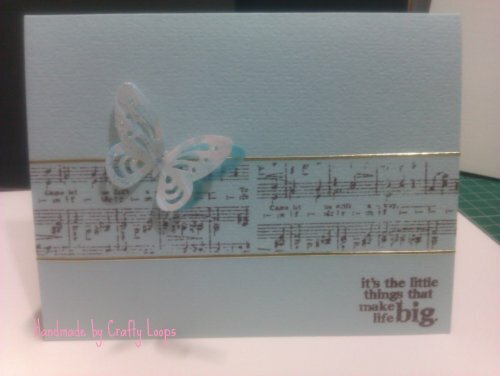 Its from one of my very favourite stamp companies, Crafty Individuals. I LOVE their stamps. 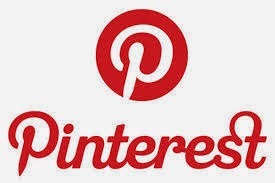 In fact I love all their products. If you want to buy this particular stamp which is a whopping 75mm x 90mm, click HERE. If you fancy taking a look at Crafty Individuals wonderful stamps and products, click HERE or for their Blog click HERE. Just so you know, I am not linked to Crafty Individuals in any way, I just think they are a fabulous company with beautiful products and incredible customer service too. That's it from me for another wee while folks. Its my Birthday this month.....I'll be 33.....AHHHHHH! So I will be putting together a wee Giveaway soon, so keep an eye out for that.